Parking in the East and South of Boduthakurufaanu Magu – the road around Male’ City has been temporarily banned for construction of the road. The area of the road connects with China-Maldives Friendship Bridge between Male’ City and Hulhumale’, scheduled to open later this year. Maldives Transport Authority made a general announcement last Saturday that parking of land vehicles between Marry Brown and Hulhumale’ Ferry Terminal is temporarily banned. Ministry of Housing and Infrastructure has launched a project to re-construct Boduthakurufaanu Mage. The first phase involves widening the road and use asphalt in Boduthakurufaanu Magu from the Industrial Village to the China-Maldives Friendship Bridge. 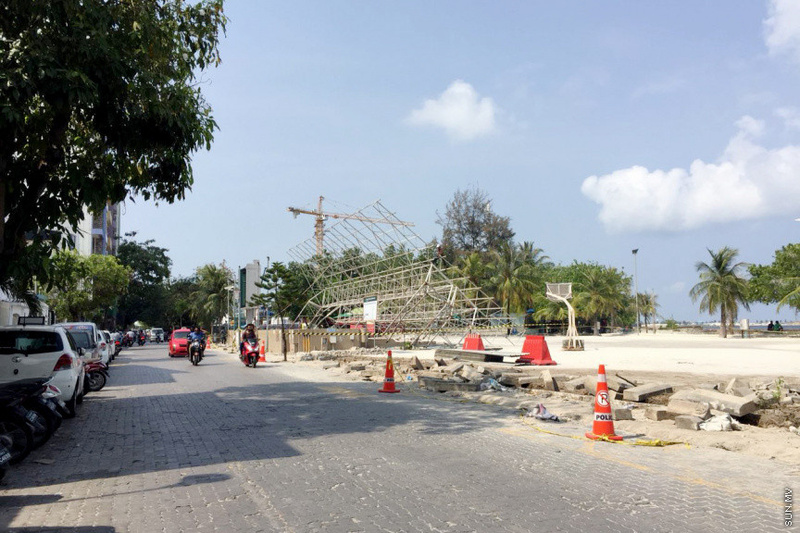 The stage at the Henveyru Artificial Beach has been demolished and trees in Boduthakurufaanu Magu have been cut down as part of the project. The area from Male’ Instustial Village to the China-Maldives Friendship Bridge will have four lanes; two for vehicles in one direction and two for vehicles driving in the other. The second phase involves widening the road and using asphalt from China-Maldives Friendship Bridge to King Salman Mosque. The ministry reported earlier that construction of the road will be complete in time for the bridge opening. Minister of Housing and Infrastructure, Dr. Mohamed Muizzu tweeted in March that about 405 trees will be planted in two sides of Boduthakurufaanu Magu from China-Maldives Friendship Bridge to the Hulhumale' Ferry Terminal.